2150036 - Ecru invitations with red floral vines. 5 1/2" x 7 3/4". R.S.V.P. 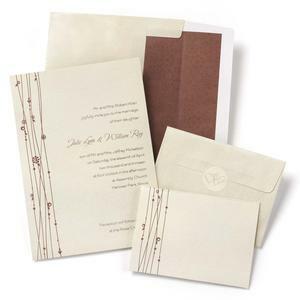 envelopes and invitation envelopes with brown liners. Ecru seals with heart design. Package of 50. © 2014 Elan Wedding Consultants Inc. All rights reserved.